The official October temperature figures are out. And it is down quite much compared with October last year – 1.01 F.
And the “warming trend” 1900-2011 is exactly 0.03 F degrees a decade. That is a whopping 0.3 F warmer in 100 years. The sweat is really breaking out! Put on the AC! And the dramatic rise from 1925 to 1926. A rise of 6.11 F degrees. A total change of a whopping 12.32 F degrees in two years. Talking about a temperature roller coaster. And notice the dramatic rise from 1946 to 1947. A rise of 5.59 F degrees. And the dramatic drop from 1947 to 1948. A drop of – 5.6 F degrees. Another temperature roller coaster that we somehow survived. A total change of a whopping 11.19 F degrees in two years. And according to the “science” and “logic” of the Global Warming Hysterics humankind would have been killed 3 times over during these years. Especially in North America. 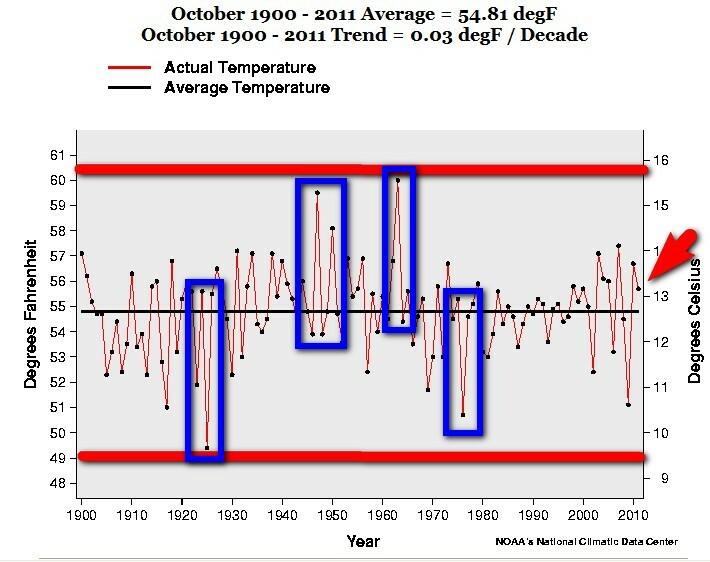 There are other years in the chart when the temperature increases/dropped 5 – 6 F in one year. And still, somehow mysteriously, USA went on as normal. But an ACTUAL RISE OF 6.11 F degrees IN ONE YEAR is nothing. And an ACTUAL CHANGE OF 12.32 F degrees in two years is also nothing to bother about. Move on, NOTHING to see here. So we can easily survive an actual change of temperature of 12.32 F degrees in two years. But a “predicted”, (by these “eminent” Global Warming Hysteric “scientists” and their models which cannot predict the weather one week from now), rise of 3- 4 F degrees in 100 years is a total catastrophe for humankind. This entry was posted on 21 november, 2011 at 11:28 e m and is filed under Fri- och rättigheter, Miljö - Environment, US Temperature, USA, Yttrandefrihet. You can follow any responses to this entry through the RSS 2.0 feed. You can leave a response, or trackback from your own site.